This blog focuses on public opinion in Armenia regarding the Nagorno Karabakh conflict using data from the 2011 Caucasus Barometer (CB). This follows a similar blog on the same set of questions asked in Azerbaijan. The results show some interesting similarities and dissimilarities between the two neighboring countries. Both populations show a great deal of uncertainty about when the conflict will be resolved. Over half of the Armenian population believes that a resolution can be found by peaceful negotiations. Also, most of the population thinks Russia, rather than Turkey, should be involved in the conflict resolution process. 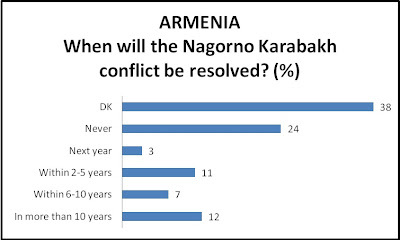 Finally, over half of the Armenian population favors recognizing Nagorno Karabakh as a formal part of Armenia, and over half say they would also accept Nagorno Karabakh as an independent country. The figure above shows that unemployment continues to be the most important issue in the country (44% in 2011)—compared to Azerbaijan in which unemployment is the second most important issue (after territorial integrity). With respect to perspectives on conflict resolution, 38% of Armenians have no idea about when the conflict will be resolved and 24% think Armenia and Azerbaijan will never be able to find a solution. 4% think that the territorial conflict has already been resolved, and 3% believe there will be a resolution within the next year. Finally, 18% are confident that a solution will be found within 10 years, and 12% say this will occur in more than 10 years. Despite this widespread uncertainty, Armenians are more confident about there being a possible peaceful resolution to the conflict rather than a resolution by force. Just about 61% believe that a solution can be found within the next 5 years by peaceful negotiations. About 21% consider the recourse to force very and rather likely (taken together) within the next 5 years. 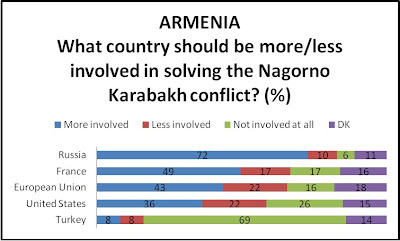 With regard to favored solutions to the conflict, 60% of Armenians favor recognizing Nagorno Karabakh as a formal part of Armenia. Just over half of the population (58%) says they would also accept Nagorno Karabakh as an independent country. As in the results from Azerbaijan, very few Armenians think joint governance of the region by Armenia and Azerbaijan is a good idea (76% of Armenians say they would not accept this). Finally, the majority say they would never accept Nagorno Karabakh being within Azerbaijani boundaries without autonomy (74%), even if the region were granted a certain degree of autonomy (77%). Finally, when asked which countries or groups should be involved as a third party in the peace dialogue, 72% of Armenians favor Russia, followed by 49% who favor France, and similar figures as found in Azerbaijan for the European Union (43% compared to 40% in Azerbaijan) and the United States (36% compared to 35% in Azerbaijan). Only 8% of Armenians favor Turkey being involved in finding a solution. However, it is worth noting that a large number of respondents from both Armenia (72%) and Azerbaijan (53%) would welcome greater involvement from Russia. Taken together, Armenian and Azerbaijani populations both display uncertainty about when the conflict will be resolved. In Armenia more than half of the population believes that a solution can be found within the next 5 years by peaceful negotiations. More Armenians prefer Russia to Turkey as the main third party to be involved in the conflict resolution process. 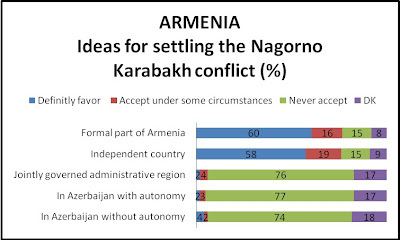 Finally, with regard to possible solutions, over half of the Armenian population would welcome formal recognition of Nagorno Karabakh as a formal part of their country and 58% say they are ready to accept it as an independent country.